In the last few days of no posts the following things have happened at our house. Bare with me here as I let new readers in on the fact that I am constantly in the middle of more than one project. My life is full and I like it that way. Some times it does interfere with enough sleep, but so far I’m still thriving. A brief recap, my mom has been very sick for over a year. Many partly finished things were moved to the back burner in order to have enough time to be with her as much as she needed me. She finally lost her battle with pancreatic cancer on Oct 25, 2011. The first weekend my sweet hubs and I moved all of her stuff, worked all week, the following weekend we had her funeral and hosted a gathering at our house afterward. That gave us the first two weeks without being on 24/7 call and two complete weekends. 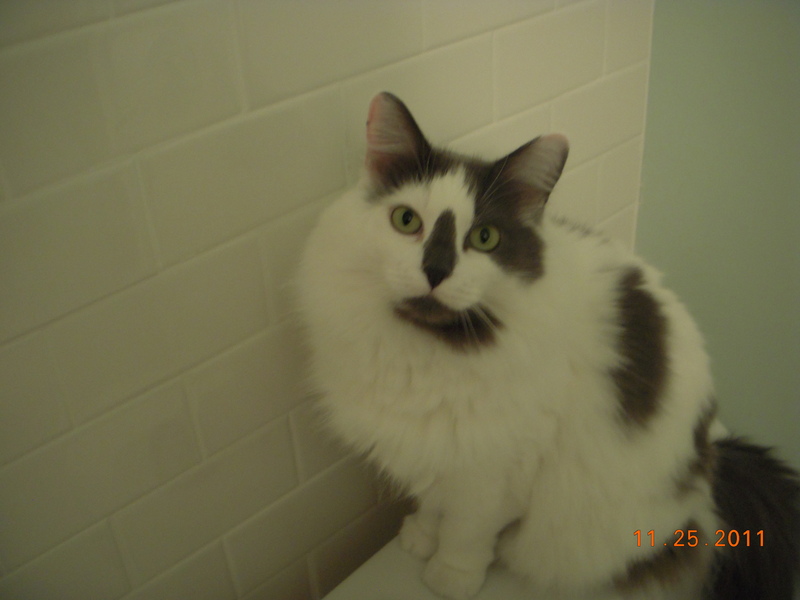 We decided to see if our mostly started, but on hold complete bathroom remodel could be completed before Thanksgiving. This little bathroom has no closet, no window, and the corner shower, toilet, and small sink make it not convenient. The tile in this photo was one of my tile jobs years ago. The bathroom was dark, dingy and difficult. The biggest problem was that when my handicapped brother would come to stay for a day or two, my poor hubs had to try to help him shower here. Since my brother needs lots of help, he couldn’t pick up a lost bar of soap from the floor and often backed into the push on and off knob. In order to turn it on, hubs would have to open the shower door. So by the end of each shower, I had one clean, mostly dry, and dressed brother and one soaking wet husband with soggy shirt, pants, and shoes. It was also impossible for our small grandchildren. 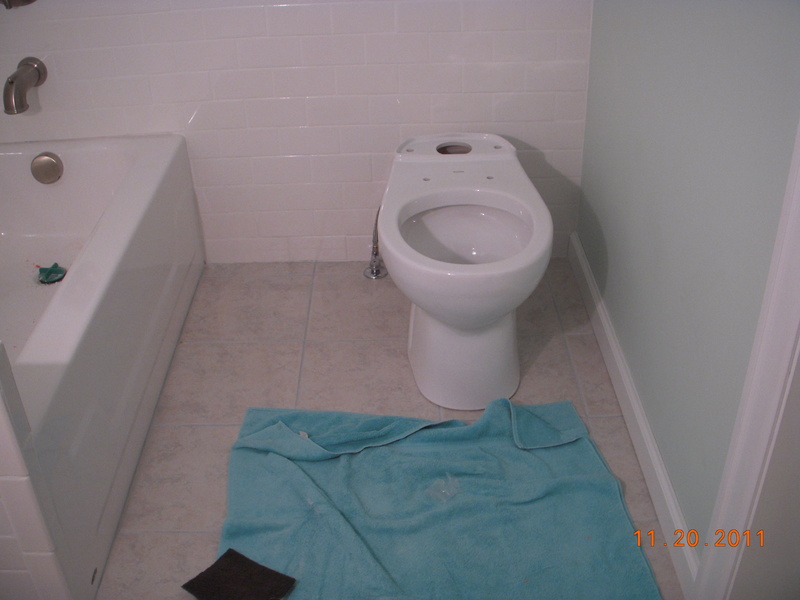 The plan, tear all of this out, refit with a small tub, energy-efficient toilet, and new sink cabinet. 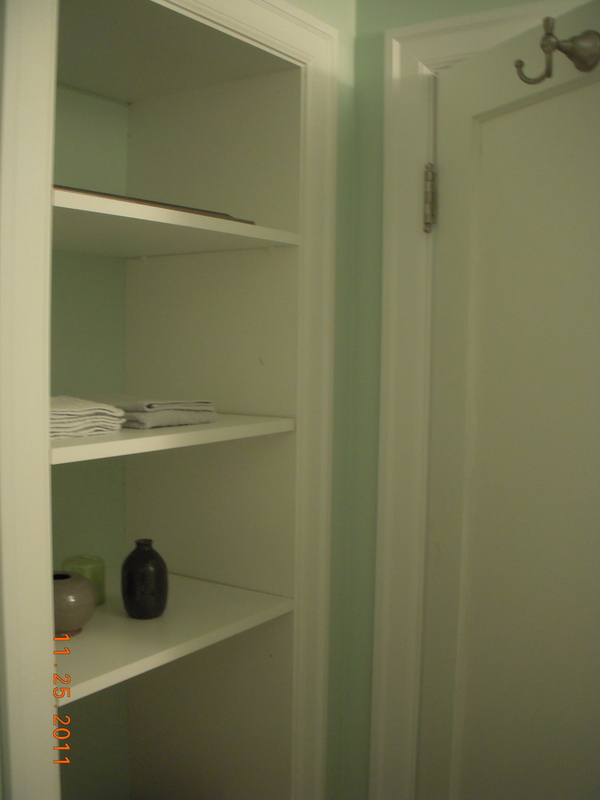 During the tear out hubs came up with a great plan to use a few feet of space from the oversized closet in the adjacent bedroom to gain space for a clothes hamper and open shelves for towels, toiletries, personal bath caddies for each person. Hubs loves to de-construct the house, then come back with all the water-proof and above code products. He had torn out, re-framed and rebuilt. My passionate part is the tile work, so as soon as things were ready I had started the tile work, when mom started needing our help, more and more. So the bathroom sat looking just like this for the next 18 months. But a start was all it was. No plumbing at all. 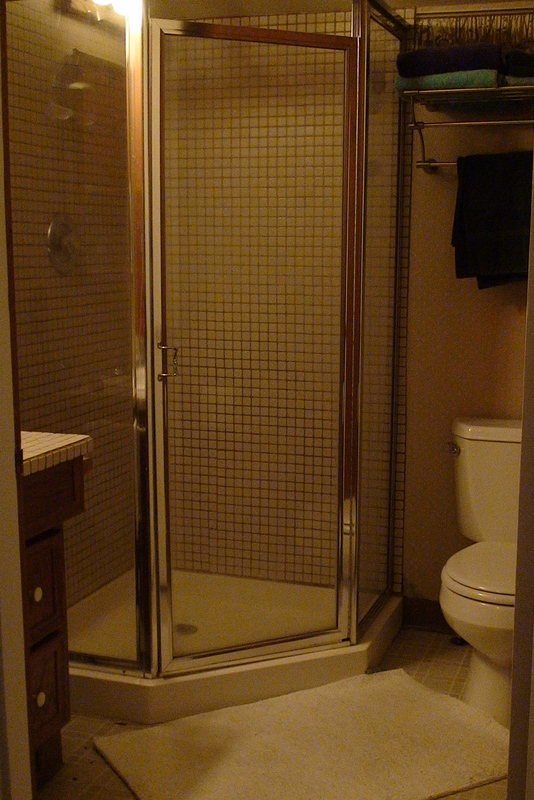 Guests had to use the bathroom in the daylight lower level, or charge through the master bedroom to use our bathroom. Hence on weekends, we usually had a parade of little people coming in and out for the bathroom and often just hopping into bed with us. But for handicapped brother, he could not spend the night during this time. Then time to work. Here is what we accomplished a few hours every evening after work and 12 to 14 hours a day on Sat and Sun. Setting tiles under the "tack strip" into the carpeted hall.Working up to the trim line. 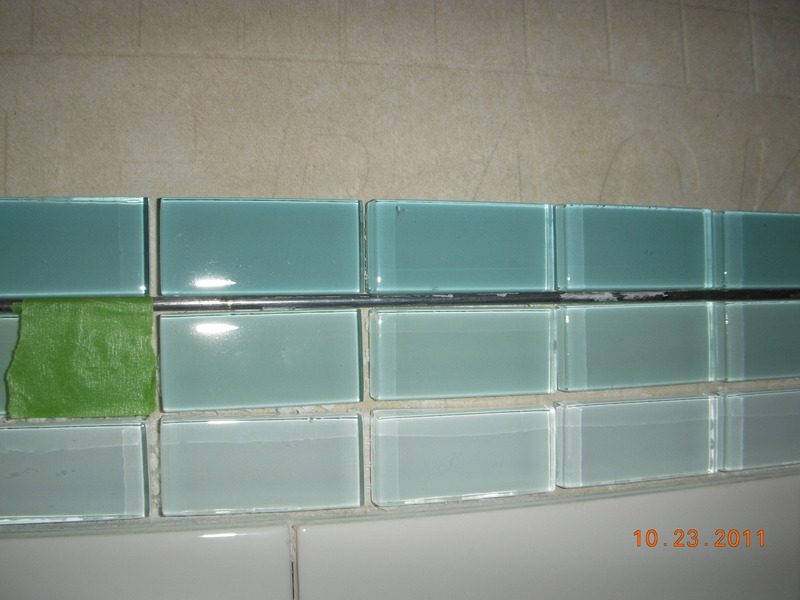 Setting the glass tiles, one at a time.The soap and shampoo alcove, each piece had to be cut with multiple cuts to adjoin the angles perfectly. Working up to the trim line. Setting the glass tiles, one at a time. Lots of tiles had to be hand cut, or trimmed, or both. Shaping tiles is a bit tricky. 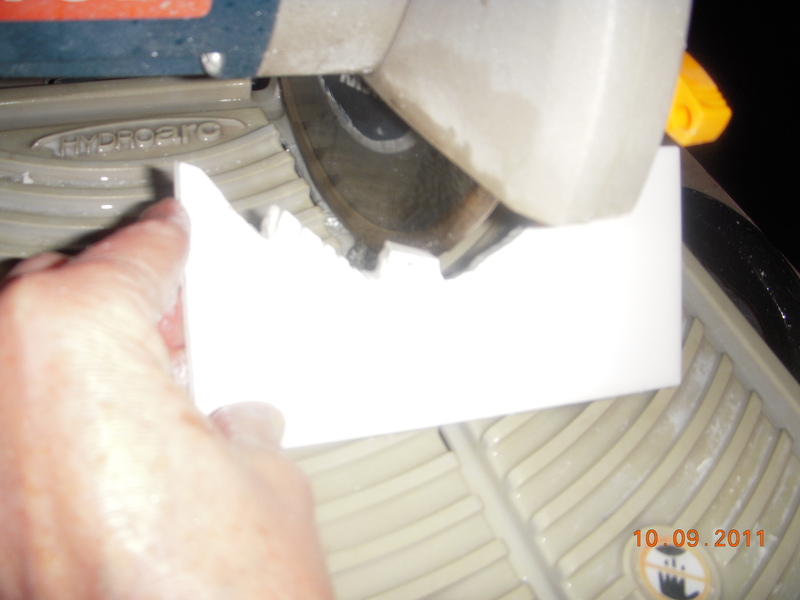 The tile saw only does straight cuts and sometimes the tile has to wrap around plumbing. 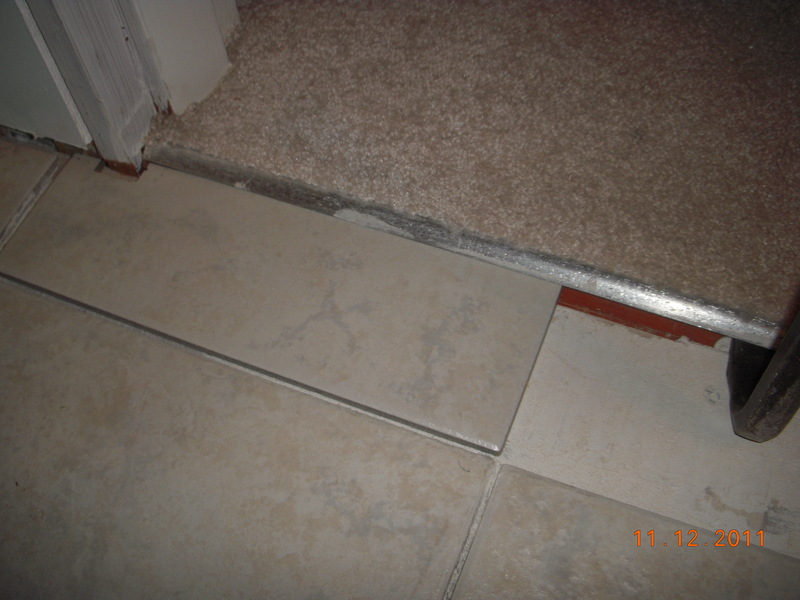 There is nearly always a decorative cover that hides the cut edges, but still it has to be worked on until it is close to the pipe or drain. This year hubs bought me my very own tile saw. They are require lots of water when cutting, so they have to be used outside and the cutter person has to actually get wet, which is okay on a hot day, not so much fun in October and November when the temps were cold and it was raining. I set my saw up under the deck and it only dripped a bit on my head. Two flights of stairs down and two back up for every piece. Fitting round cuts sometimes takes two or three adjustments. No need for a gym with the stair run every few minutes. It took no time to get the top portion of the tiles set. They are larger and go quite fast. 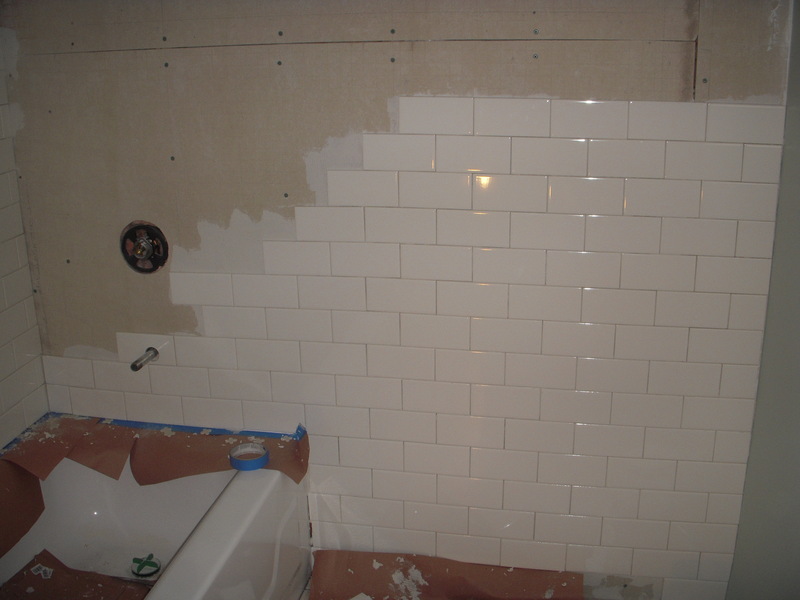 After the thin-set was cured the grout went on quickly. Not going to bother with a boring photo of that, though I took some. After the grout is all polished and shiny two coats of sealer go on everything. Then it was time for hubs to complete the plumbing. Grouting finished and sealed the plumbing is going in. The cupboard for the hamper and whatever. It hides behind the open door and is fully functional when the bathroom door is closed. 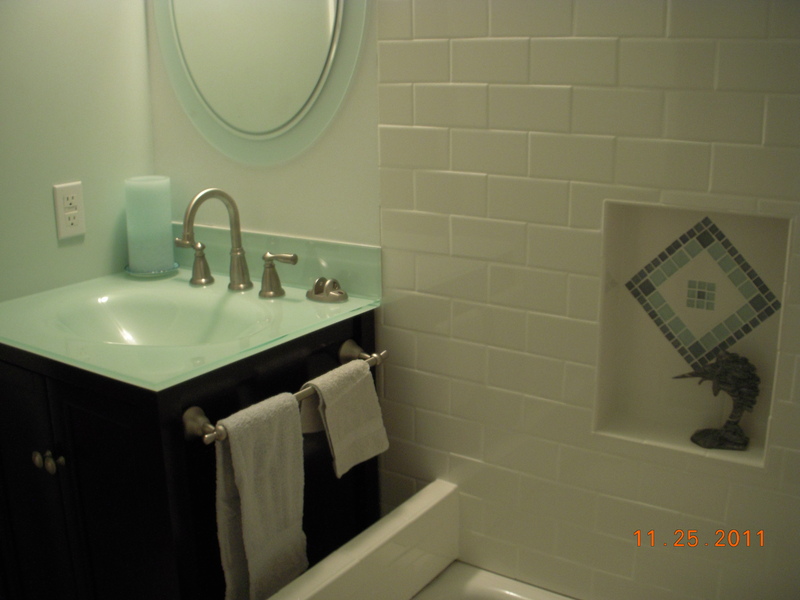 The beautiful glass topped sink and espresso cabinet. Jasmine, one of our three cats approves our work. After: Same view as the first photo, the "before" photo. It was a nearly completed project on Thanksgiving morning. The toilet worked, but the sink drain that came with our kit was for a ceramic sink with the overflow. It would not fit the new glass sink, so even though the water worked, we had to keep it turned off at the cut off valves. No one could actually use the sink. The tub plumbing was not quite finished. Hubs got everything done on the weekend while I did lots and lots of dishes. We have a train rack style towel bar and the shower rod to hang and we are done!!! So Let me know what you think about our project. I do have a book in progress for anyone who might ever want to actually do their own tile work. For me, I have been hooked on it for years. I absolutely love doing it and creating something that stands up to the wear and tear of a family and required so little maintenance to look like new for decades. Tomorrow I will try to share our Thanksgiving with you. The photos from my cell phone are not all that awesome, but the day certainly was. The leftovers have made dinners fast and delicious. I’m so thankful hubs and I both LOVE turkey. PS A little addition to yesterday’s post is all I have time for, it’s nearly midnight already. See you tomorrow. Don’t know if my first comment registered so I am doing a second one. I would love to read your book……you and Russ do wonderful work and I really need to hire you two or barter with you two since I am not great at finish work – I’m more of a demolition derby !!! Let me see, a working vacation in Florida. I could really totally do that!! Yes I did get a comment the other day. Thank you so much. I appreciate it. BTW I’m pretty good with a jack-hammer or sledge hammer, also. But why take all the fun away from hubs. The best part is seeing it coming together as a finished project. Fabulous!! We have a 5 bedroom home, 2 story. 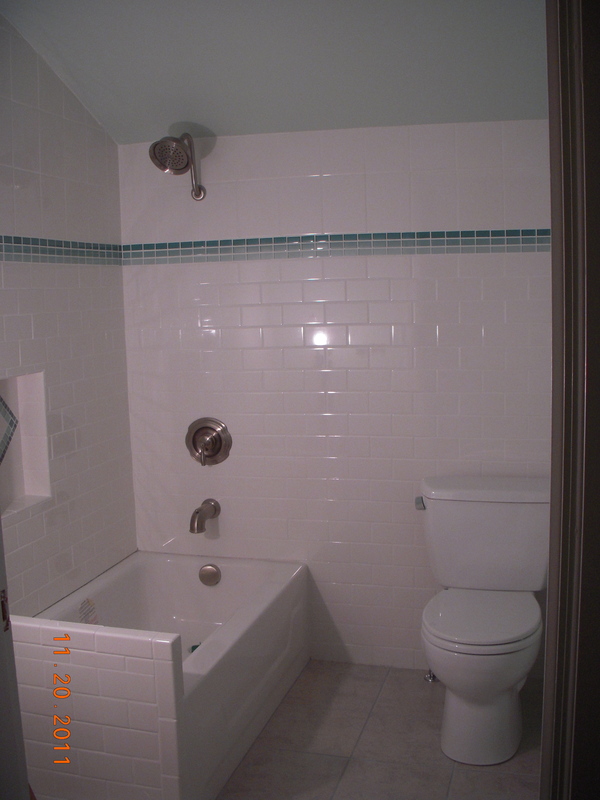 One guest bedroom downstairs but only a half bath, toilet and sink, to accommodate their needs! The “toilet” room, (since there is no bath, is very small and it would be impossible to make it something bigger but… we have a large laundry room they we have thought seriously of changing into a wonderful bathroom. This inspires me to think it could be so beautiful!! You have worked long and hard and the results are magnificent!! Love the tile work and yes I would be interested in a book of how to!! Christine, thank you so much. I love the way it turned out also. You’ll have to come see it soon. Also, kind words of encouragement to do the book. Now I’m really, really happy. Two possible sales already!!!! Or gifts to friends. I re-read my blog today…oops. It was supposed to have some other pictures in there and it was supposed to be short and random. In the end it was only one story with a lots of words and it was late. I also see that I should never post anything until the next morning, after my coffee, while my brain is alert. By midnight I miss way too many typos, missing words, random non-sense and non-sentences. Thanks Xandre, it was necessity that I learned how to remodel. We bought a fixer upper on a tight budget. Books from the library, asking a million questions at the lumber yard, hardware store, etc. I plunged ahead. Fortunately supplies are quite cheap and I had more time than money, so I would re-do until it was good. The more I learned the more I loved it. I have always dreamed of building a house from the ground up. It wouldn’t take as much time as tearing out a house room by room and replacing each as we went along. My hubs and I have split specialties and that works out great. Never fear, anyone who can build a Christmas tree can remodel a house. You’ll have lots of picture opportunities as you work along.